Description: Realist Laura Shechter is known for her still life paintings. This watercolor shows the meticulous detail and the tight control of color one expects from this artist. Visit Laura Shechter's Brooklyn studio for more information about her working process. 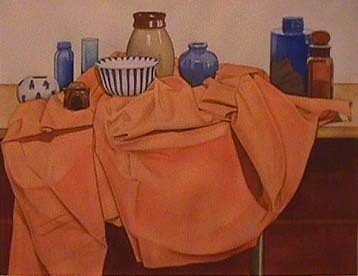 Interestingly, this watercolor uses a compositional structure-an unusually high horizon line--that anticipates a later painting by Shechter entitled Still Life with Blue Cloth. An important contemporary realist painter, Laura Shechter is represented in major museum collections including: Boston Museum of Fine Arts, National Museum of American Art (Washington, DC) and Art Institute of Chicago and National Academy of Design (NYC). View more Laura Shechter works for sale at Biddington's.